This winter in Chicago has been cold and gloomy. We’ve had constant snow, record cold, and day after overcast day. But the sunflowers my children brought home one day-they were full of hope. Light in the middle of darkness; a glimpse of summer in the middle of winter. This piece is 18×24, acrylic on canvas. 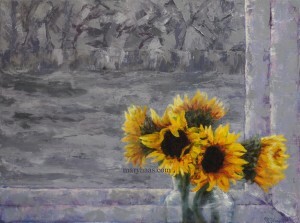 Prints of Sunflowers in Winter available here.